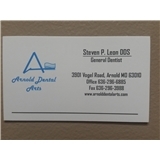 Arnold Dental Arts (Arnold) - Book Appointment Online! Our Philosophy is to provide the best possible and most thorough dental and craniofacial treatment for each of our patients. To support this philosophy we adhere to the following guidelines for our practice: Do what needs to be done; Do it well; Do not do what doesn’t need to be done; Do not omit anything! Our goal, therefore, is to help our patients, each having individual needs and desires, reach the best level of dental and craniofacial health they possibly can. In order to accomplish this we have an obligation to our patients to continue to learn and train, exposing ourselves to as many educational opportunities as we can. This acquired knowledge must then be appropriately applied to our clinical setting. Dr. Leon is excellent! I highly recommend you see him. I cannot thank him enough for the wonderful work he has done for me, his kindness and giving me my smile back!